I always like to read books by authors that are new to me. When I read the synopsis I thought this would be a good book to read. I found that Trust My heart was a sweet romance. I liked that it was light and fast to read. The town was well described and made me feel like I wanted to be part of it. I think this would be a book many people would enjoy. 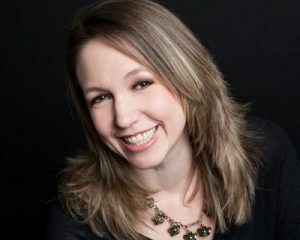 I think I found a new favorite author! 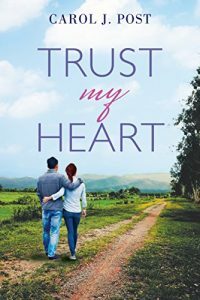 This was a really enjoyable book and fast paced. I love that it took place in New Orleans and the Furry Godmother sounds like a great store! I had a lot of fun trying to solve the mystery. 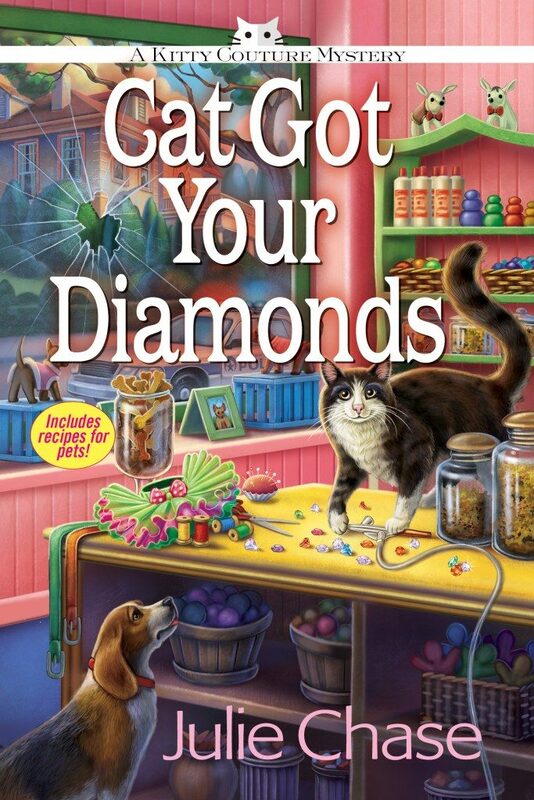 If you like cozy mysteries and animals you will love this book! Enter to win a digital prize packs of books 1&2 in Julie Anne Lindsey’s Geek Girl Mysteries A Geek Girl’s Guide to Murder, book 1 A Geek Girl’s Guide to Arsenic, book 2. Click HERE to enter. I voluntary received a copy of this book for a honest review. Do you want to feel good about the way you look? I do! 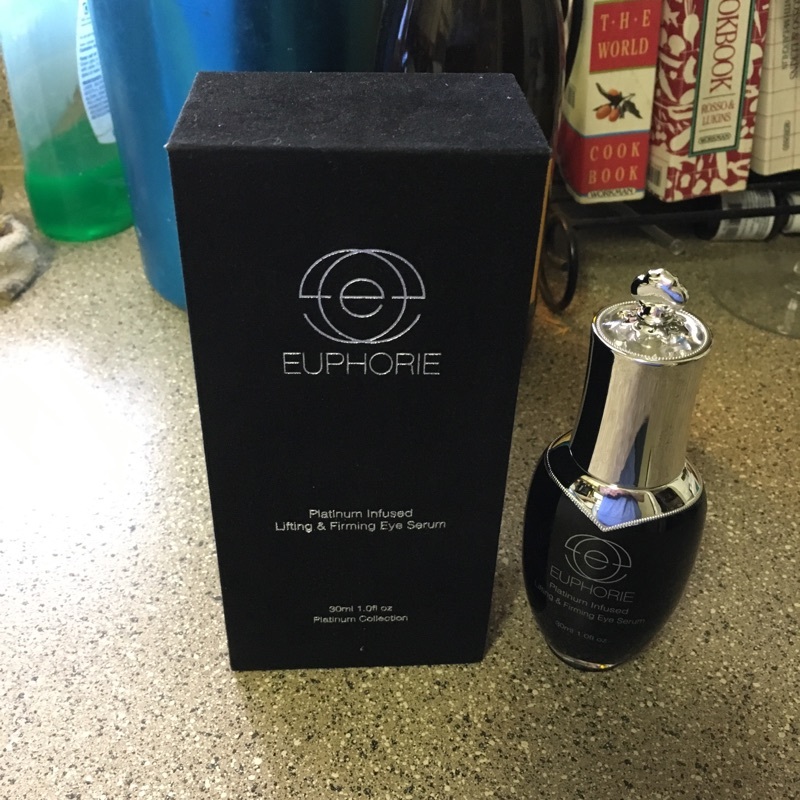 That is why I was excited to try Euphorie’s Platinum Infused Lifting & Firming Eye Serum. 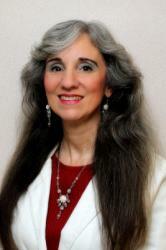 I am in my 50’s and when I look in the mirror I was seeing wrinkles and black circles under and around my eyes. Euphorie’s Platinum Infused Lifting & Firming Eye Serum is a luxurious eye serum good for lifting and firming the skin around your eyes. It helps reduce puffiness, the black circles and wrinkles by deeply hydrating and nourishing your skin. It has vitamins A and C, green tea, aloe vera, collagen and platinum in it. It helps instantly removes signs of fatigue from your eyes and with extended use will help ease away the wrinkles. The state-of-the-art anti-aging science to turn back the clock, the innovators behind Euphorie implemented collagen into their products in order to achieve rejuvenated, healthy skin like never before. Euphorie’s glamorous packaging is just as chic and sophisticated as the inner workings of it’s formula. The cosmetics are presented in dazzling bottles in an array of eye-catching designs, which are symphonic with its luxe theme. The packaging exudes indulgence so much so that it can also serve as a statement vanity piece. Each plush box of Euphorie cosmetics is fashioned with velvet both on the outside and the inseams. I liked how luxurious the serum feels. It is thick and soaks into my skin. It is easy to use just put on your finger tips and gentle work into the skin from corner to inner corner of your eye. I use it morning and night. Euphorie’s Platinum Infused Lifting & Firming Eye Serum will be great to use when you have a late night during the holidays. Euphorie has a whole line of great products that will make you feel and look fantastic. Can you believe that Christmas is just around the corner? I know many of you are looking for Christmas gifts that keep your kids busy for hours. Here are a couple for the artist in your family. In Disney Palace Pets Art Studio ($26.99; ISBN: 978-1626865402; 128 pages), you’ll love drawing and painting these 19 adorable Palace Pets adopted by the Disney Princesses. The detailed, 128-page project book will teach you how to illustrate them like a professional, then use the included 3 watercolor paints, 2 paintbrushes, palette, drawing pencil, 7 colored pencils, fine-line marker, kneaded eraser, and sharpener to bring them into full color. Once you’ve mastered the techniques, create beautiful artwork for children’s parties and fun surprises for your loved ones’ lunchboxes, or just draw them to relax and have an adorable piece of art to show off! Ponies, bunnies, birds, and even wildlife pets join the playful puppies and kittens loved by the Disney Princesses. You’ll love them, too! Get started now and let your imagination run wild. I think it makes drawing easier – when it gives you the step by step instructions. I am not very good at drawing but with these steps I should be able to do a pretty good job. Then after drawing these cute little animals you can color them with water color or colored pencils. 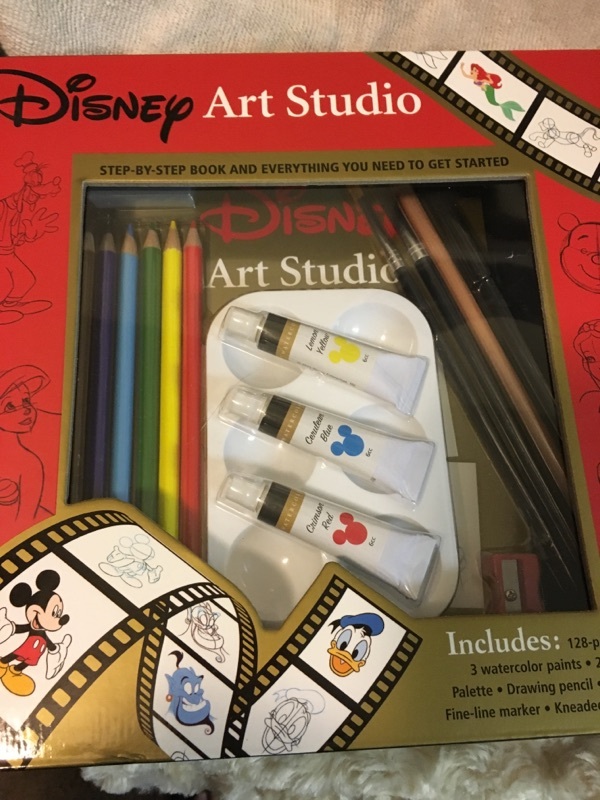 Here is another great kit – it is the in Disney Art Studio ($26.99; ISBN: 978-1626865372, 128 pages) Snow White, Cinderella, the Little Mermaid, Winnie the Pooh, Mickey Mouse, and many more of your favorite characters leap off the page with your drawing and painting skills! 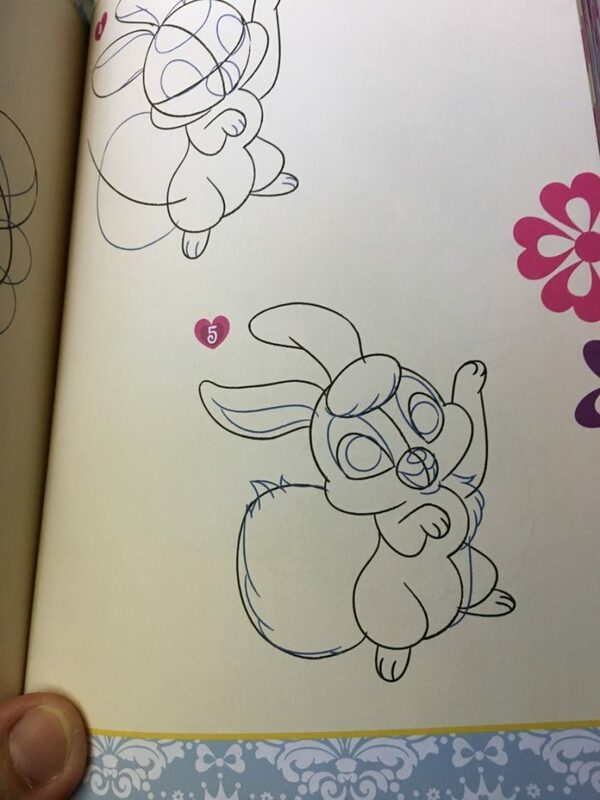 Easy-to-follow instructions and art tips from Disney’s own animators will help you learn how to draw 45 favorite Disney character just like the professionals. Included in the kit are 3 watercolor paints, 2 paintbrushes, a palette, a drawing pencil, 7 colored pencils, a fine-line marker, a kneaded eraser, a sharpener, and a 128-page project book to bring these characters to life! 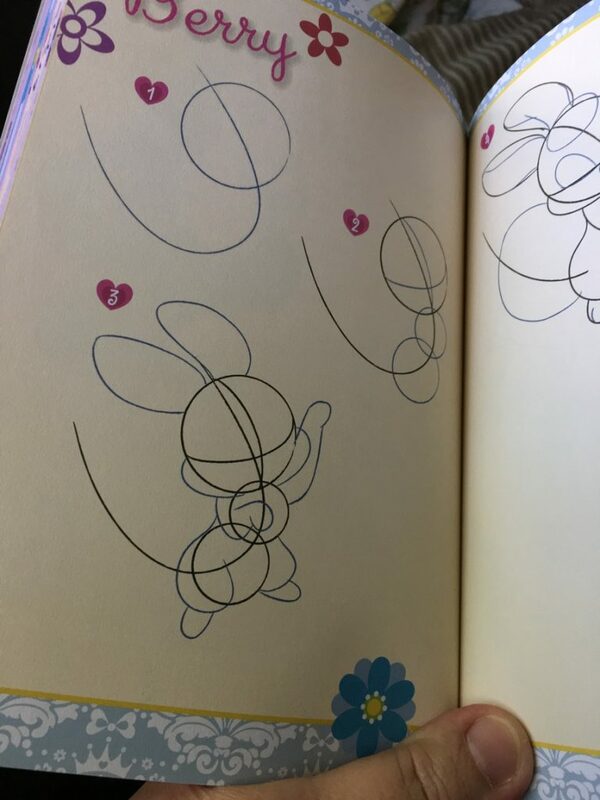 I like the book that comes with the kit – it has so many helpful hints and tips. I think this is one of my favorite things this holiday. It would be great for adults who like to do art journals, doodle and draw. It is also great for someone who is just starting to draw. 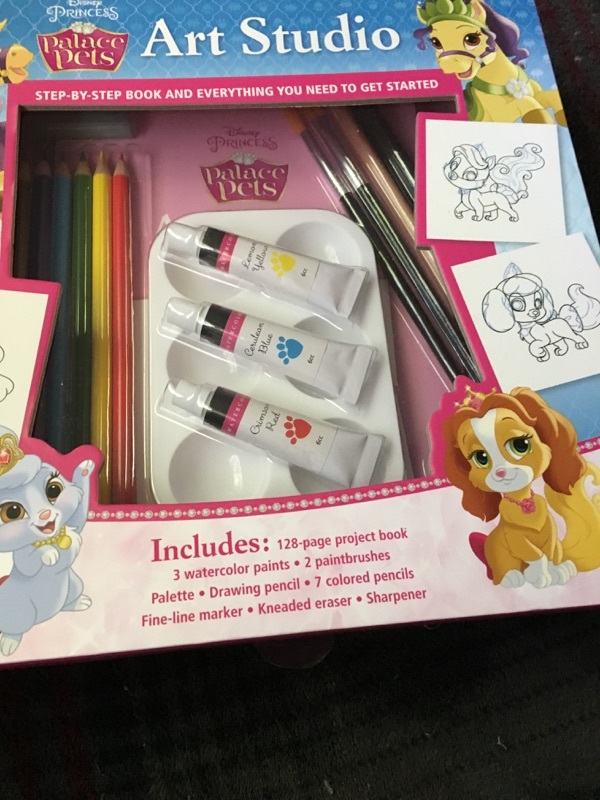 If you would like to purchase either the Disney Art Studio or the Disney Palace Pets Art Studio you can find them at Thunder Bay Press or locally at stores like Target or Walmart.